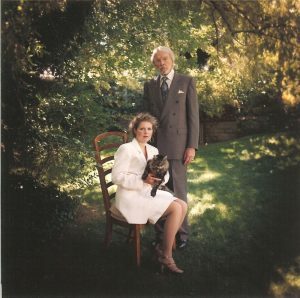 Photographers: M. Harding Burgoyne; Robert H. Burgoyne, MD. 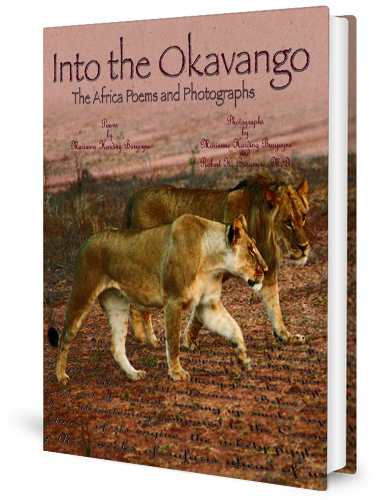 Into the Okavango: The Africa Poems and Photographs (ISBN 0-9742183-0-8) is a 216-page, 92-poem, 500-photograph, 12 x 13 inch adventure, taking its readers on twenty-three days of safaris through Botswana, Zimbabwe, and South Africa, detailing first encounters with elephants, cheetahs, lions, leopards, hippopotamuses, crocodiles, and more. The photographers feature Victoria Falls and Cape Point by helicopter. 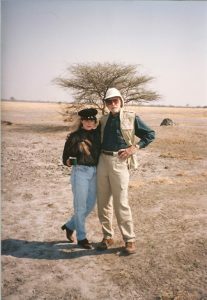 As the safaris get more dangerous, the camps more remote, the poet embarks on a darker, shadow journey to the sad, painful secrets of her soul, not often visited. There, in the small, dark section of the poems (Cutty Sark), she confronts a childhood tragedy and its lifelong consequence. Rounding Cape Point by helicopter proves to be a triumphant catharsis for the poet. Exquisitely photographed, Into the Okavango is organized by individual safari camps, featuring a bleeder page and two-page spread for each of the nine camps, 4 x 6 photographs on verso pages set up as a photograph album, and large 8 x 8 photographs on recto pages, which feature close-ups of the animals. In short, this poetry-photography collection about Africa’s animals explores an autobiographical epiphany and functions as an eclectic travel guide as well. Readers who love adventure, the lure of undiscover’d country, the face of death, will like the purposely simple, fast-reading, revelatory poems—creative memories—and find two journeys worth their taking.